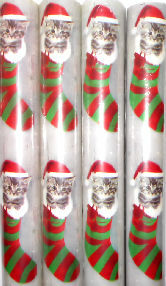 This Christmas wrapping paper features a kitten wearing a Santa hat while sitting in a holiday stocking. This is a half roll (13" high) of wrapping paper. The paper is 13" high x 360" long (30 feet).